Apparently it's a tradition for American Thanksgiving to have dinner rolls on the table. 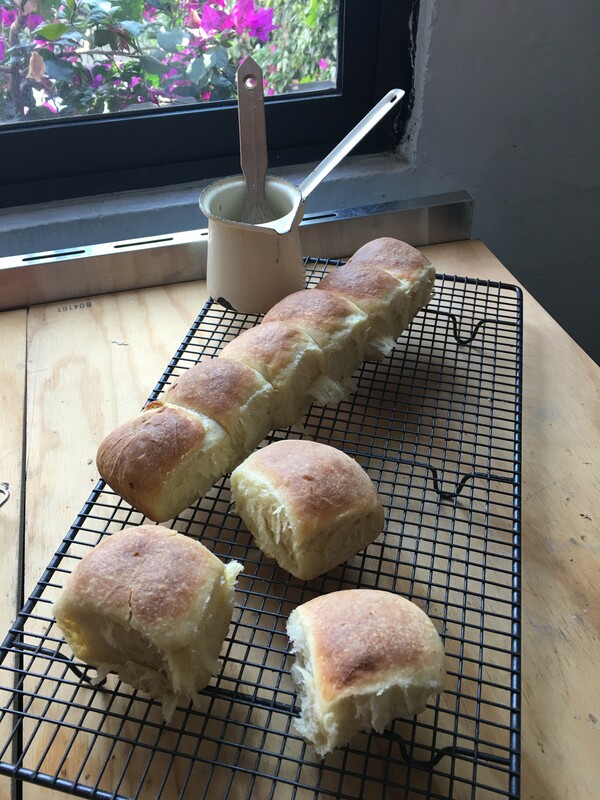 The addition of "dinner rolls" and "green bean casserole" to the Thanksgiving table are two "sides" which do not make it on to the Canadian Thanksgiving table, at least, not to ours. I was delighted to be asked to make the pumpkin pies and the dinner rolls for the American Thanksgiving dinner to which I was invited yesterday. I elected to make brioche buns because there was simply not going to be enough rich food! 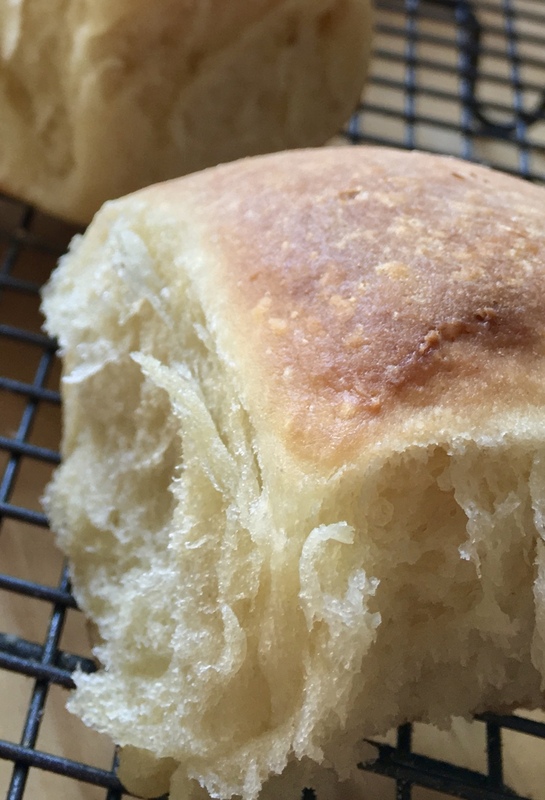 Making brioche is simple. 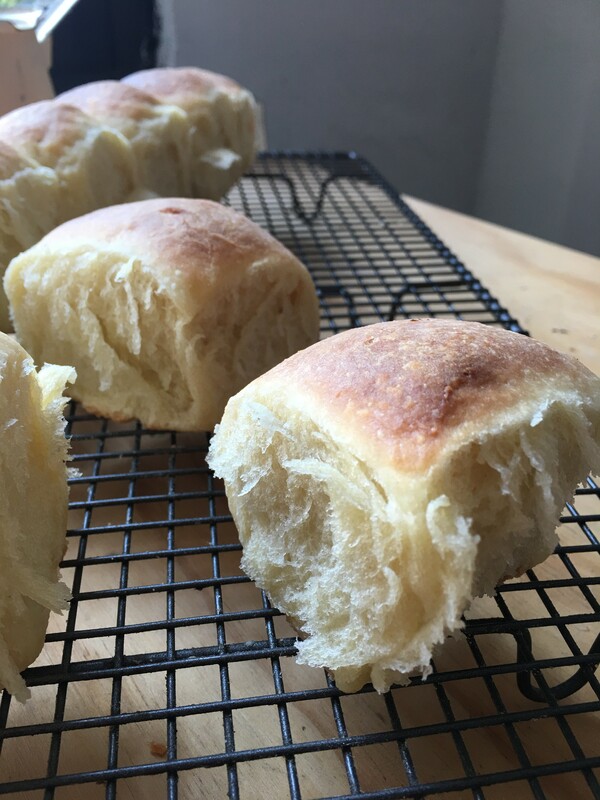 However, you need a bit of courage (for when the butter starts to melt) and patience (for when you are shaping the buns out of what seems only marginally more structured than a puddle). 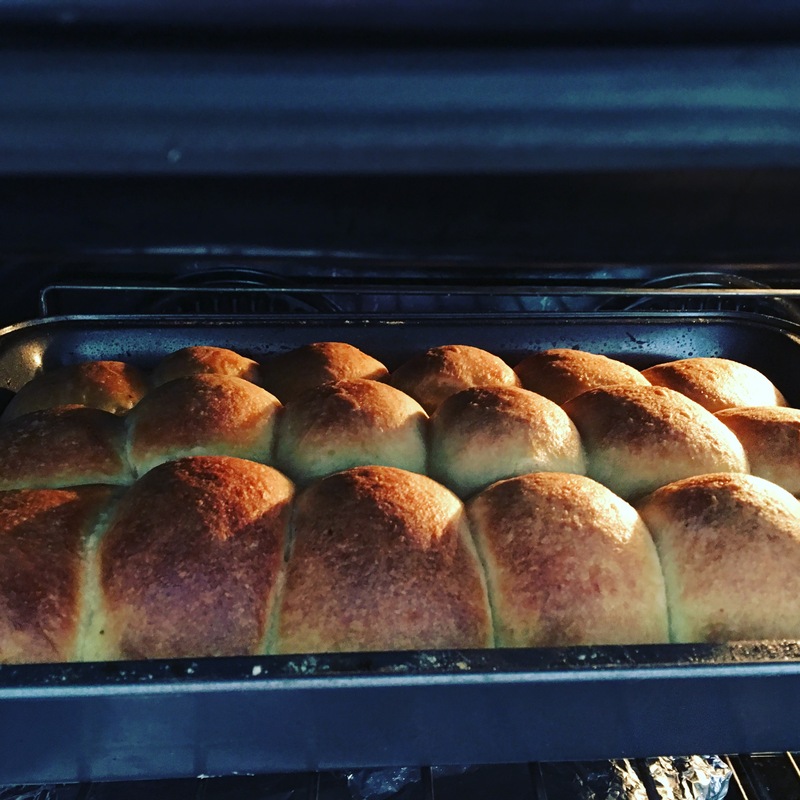 First things first - the recipe for delicious brioche. Measure the flour into a bowl and make a well in it. Sprinkle in the sugar and then the yeast. Pour over the milk and close the well by flicking flour over the milk. Cover and leave it for an hour. This gives the yeast some puff so it finds it a bit easier to do it's job in a dough that is 1/2 butter. Crack in the eggs and measure in the salt (away from the eggs so it does not harden the egg yolks). Bring all the ingredients together and knead for 10 minutes whether by hand or machine. Add the butter and knead for a good 10 minutes more. DO NOT PANIC. If you are kneading by hand, the butter will melt, there will be a lake on the counter, you will think you have done something wrong and consider throwing it away. YOU HAVE DONE NOTHING WRONG. 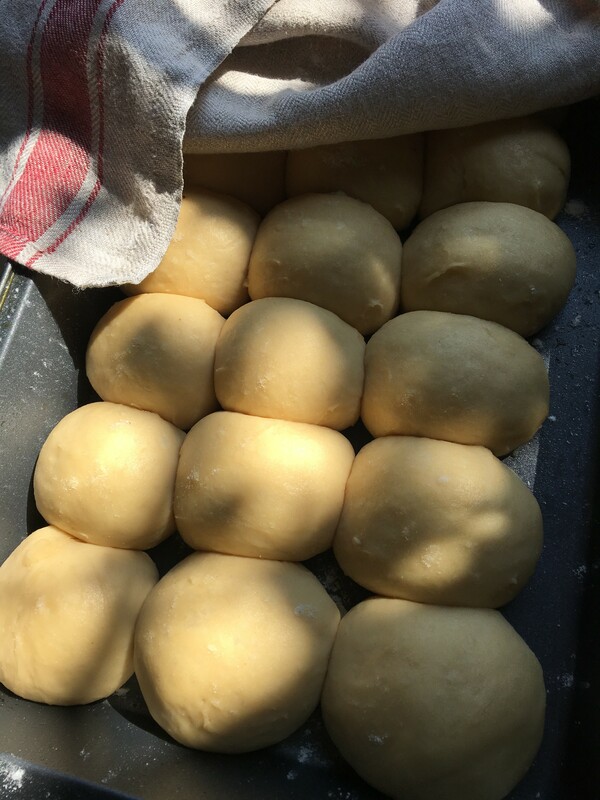 The dough will come together and be the consistency of chewing gum. Dark golden streaks will appear in the dough and you will breathe a sigh of relief. Scrape it all up and pop it back in the bowl. Cover with a shower hat and leave it to rest. You can put it in the fridge overnight or leave it for 3-4 hours at room temperature. It will triple in size so don't rush it. When it has tripled in size, scrape it out onto a lightly floured surface and divide it into balls of about 50 g each. 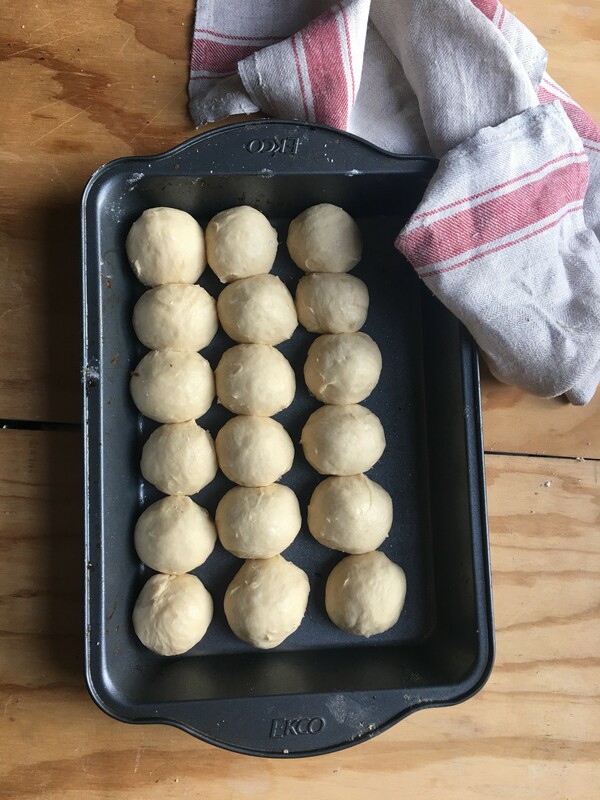 If you cannot be bothered weighing, that's ok. You will get about 9 balls of 50 g each so just divide the dough by eye into 8-9 pieces. Lightly flour the tops of them. Very lightly. 1. with a scraper, move a blob of dough so that it is in front of you and flip it over so the LIGHTLY floured side is down. 2. dip your palm in the bowl of flour so that you get a light coating of flour on your palm. 4. Start to rotate your whole hand, keeping your finger tips on the counter. Have a look at this video for shaping buns. Ignore the part about flour on the surface (because you have floured the tops of the buns) and ignore the part about stretch and fold (brioche dough is too soft to bother). Just concentrate on the part about rotating your hand when it is cupped over the dough. When I can get to it, I will do a special video for brioche buns. Snuggle the buns together in a tray (like the top photo) and leave them, covered with a tea towel or shower hat if you have one big enough) for 2-3 hours. If your dough is cold from the fridge, they will take longer to triple in size than if you are starting with warm dough. You want them to triple in size again. Preheat the oven to 180 degrees celsius. Melt some butter and then add a splash of milk to cool the butter down to room temp. Brush it over the tops of the buns. Pop them in the oven and bake them for 30 minutes. The tops will get dark golden and the smell will be amazing. Close up of "ooooo that place where they joined together..."
Remove them from the oven and, if you would like to, brush them with more of the milk and butter mixture. Take them out of the tray and let them cool completely (if you can wait that long) on a wire rack. Fancy taking a bread course? Click here to book one! We look forward to welcoming you.